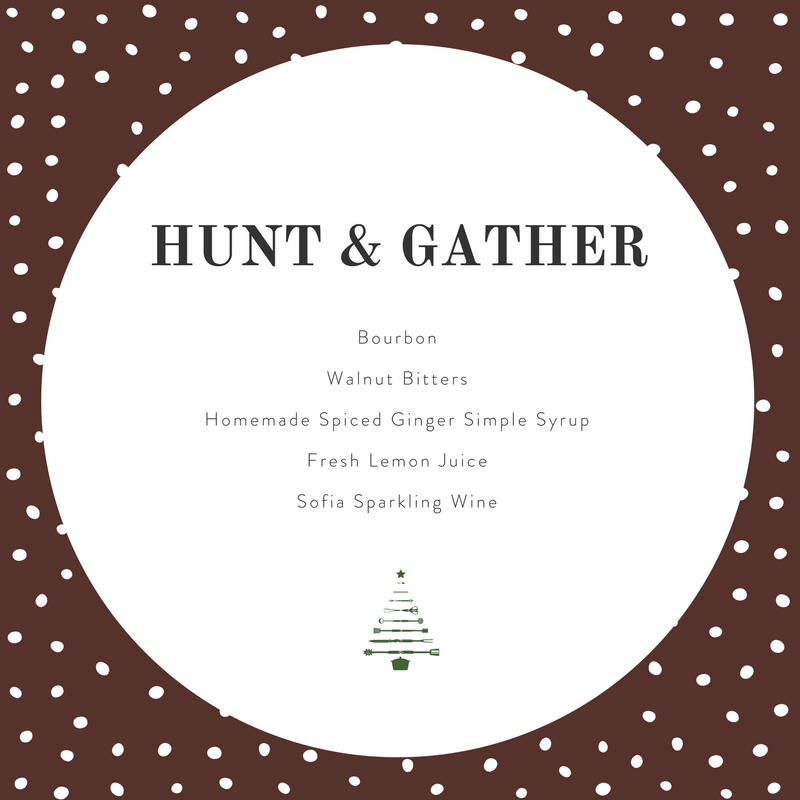 Last week, we talked about hosting a holiday party and creating personal and creative takeaways for your guests - and we used the cocktails that you served as the inspiration. 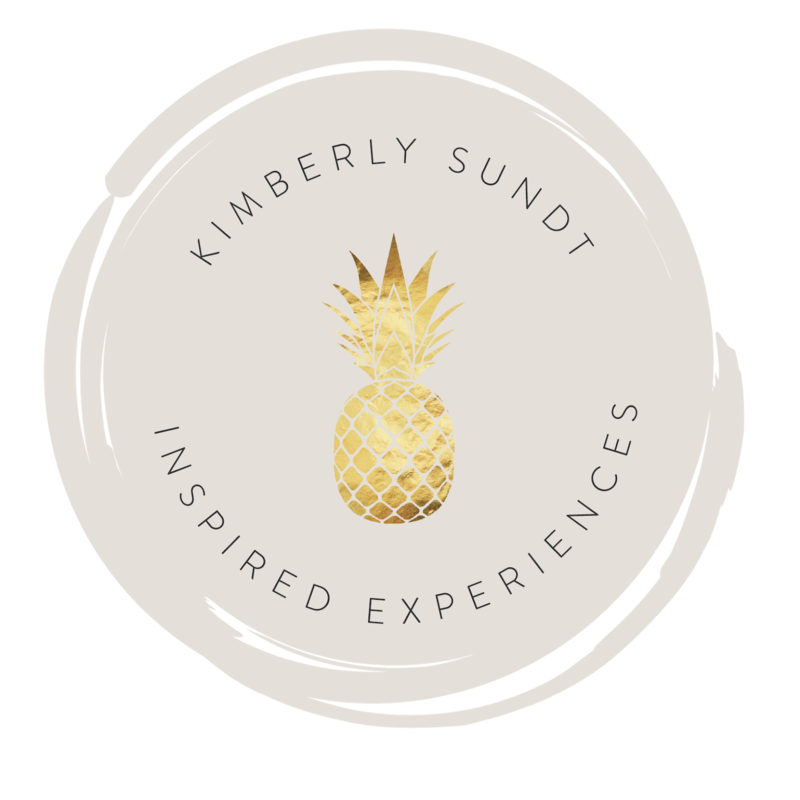 Mandy Landefeld of Sumptuous Living created those yummy cocktails. 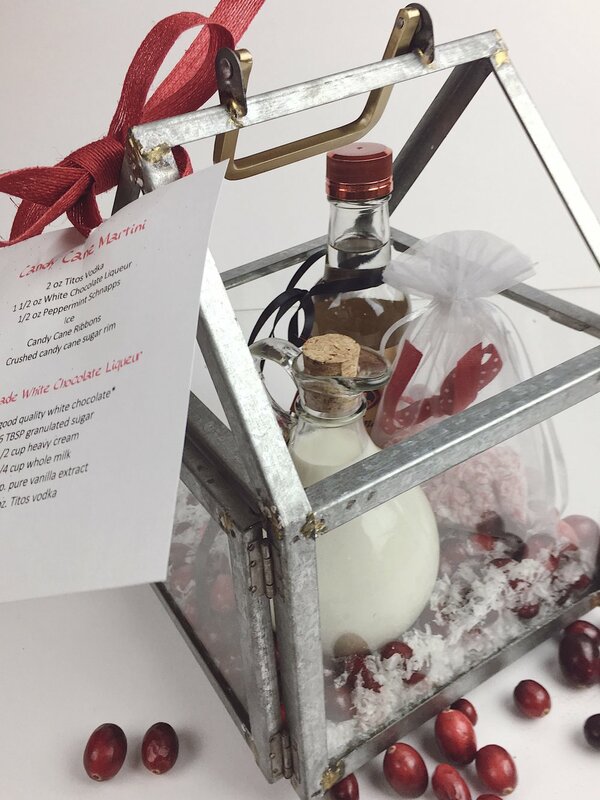 This week, we take those cocktails and turn them into beautiful and appreciated hostess gifts. As the guest, you can still provide a dose of hospitality. For the workshops that Mandy and I did for Atlanta Homes & Lifestyles, we worked with Coppola Vineyards and their Sofia Brut Rose and Blanc de Blancs, as well as Tito's Vodka and Four Roses Bourbon. Fun partners! The cans (yes, cans!) 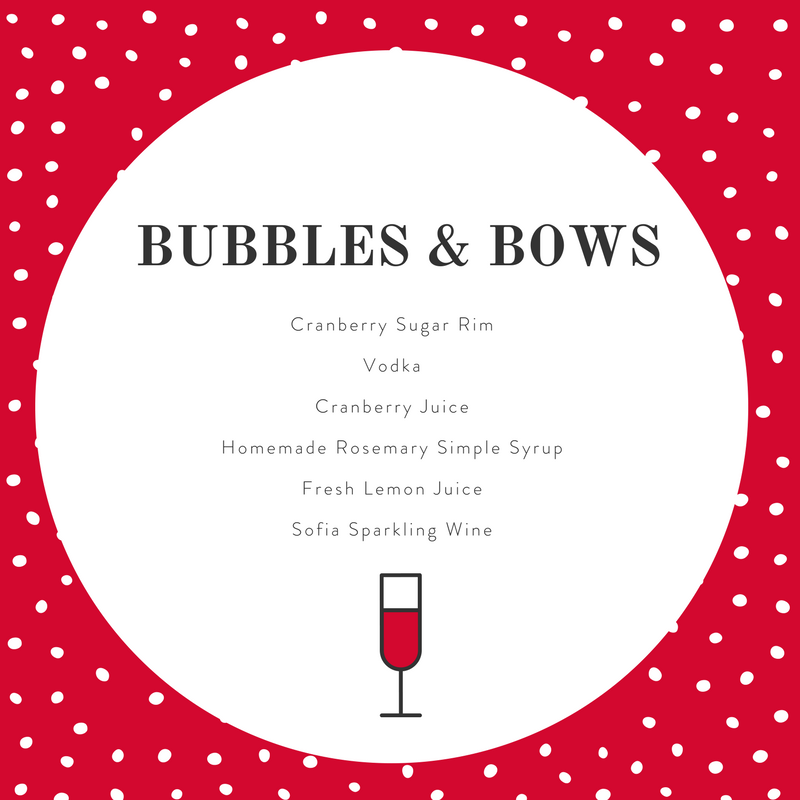 of bubbles come four to a box, and each comes with its own straw. They are adorable and as Mandy explained, these cans are great to have in your bar when you don't want to open a full bottle. As you can see here, the Sofia boxes have holes all around them (think bubbles), and so in the image above, I took the cans out, threaded the ribbon through, put the cans back in and took an already wonderful hostess gift into something special and beautiful. If you didn't see last week's post, we had three cocktails. You can sign up to get the recipes here. Will it make the host/hostess feel special? Is it personal? If you've taken the time to do more than a bottle of something,is it unified with either color or theme? Is there a creative, fun factor? 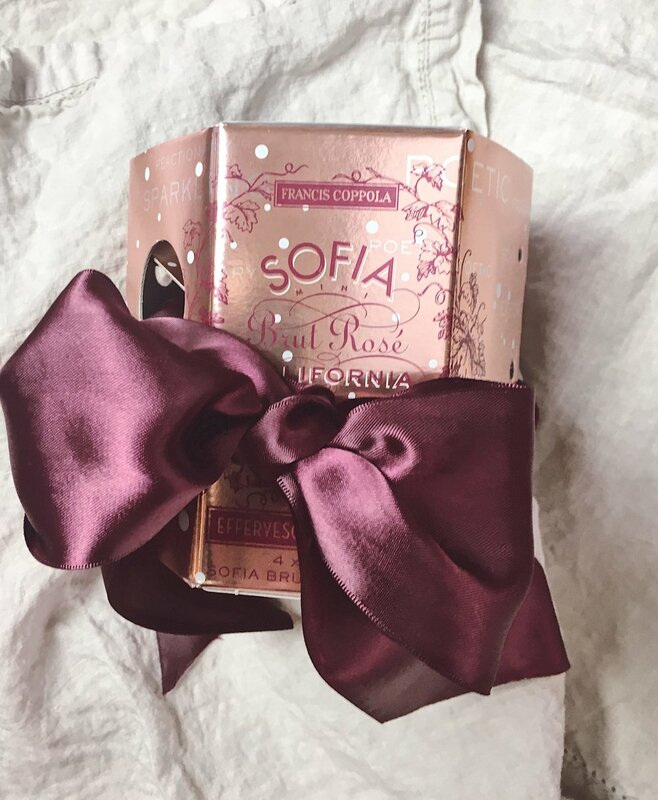 To keep it simple, you could take the box of Sofia above and tie the recipe onto the ribbon. Or . 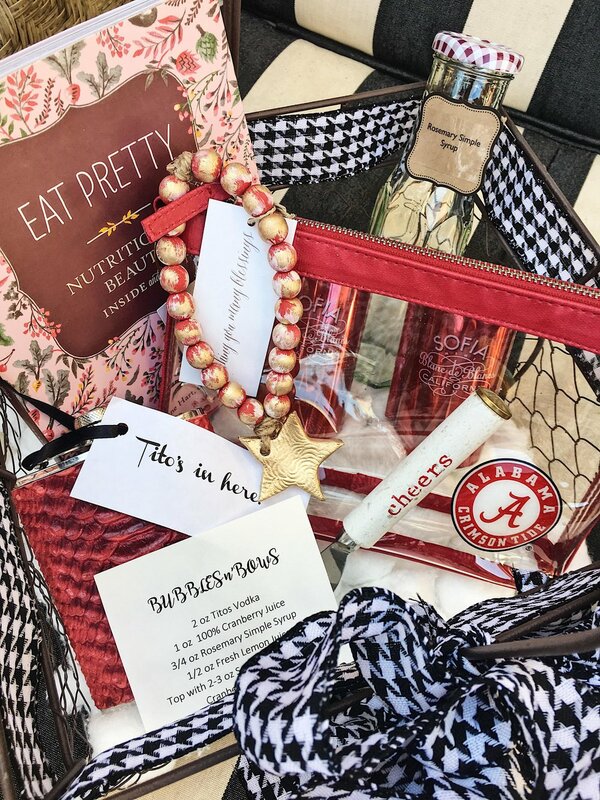 . . . .
Alabama Hostess Gift - Roll Tide!
. . . . . . . you could take it up a (several) notches. So, here's what we've got above - they link to the shops where I found them. Look at these gifts and think how you can deconstruct them. For instance, in the basket above, you could easily take the flask and fill it with something fun and that's the gift. Or, take three of these items rather than the entire thing. One of the easiest things to do if it is a gift for a man is to get a bottle of bourbon and throw a tie on it, or even better, a bow tie. Loosely wrap it around the neck of the bottle - it's the way he will look the next morning! Or . . . you can take it way up. It would work well year-round, but especially in the fall and winter or at a mountain or lake house. The Candy Cane Martini is a dessert drink, and during the holidays that makes me think about warm, cozy, white. 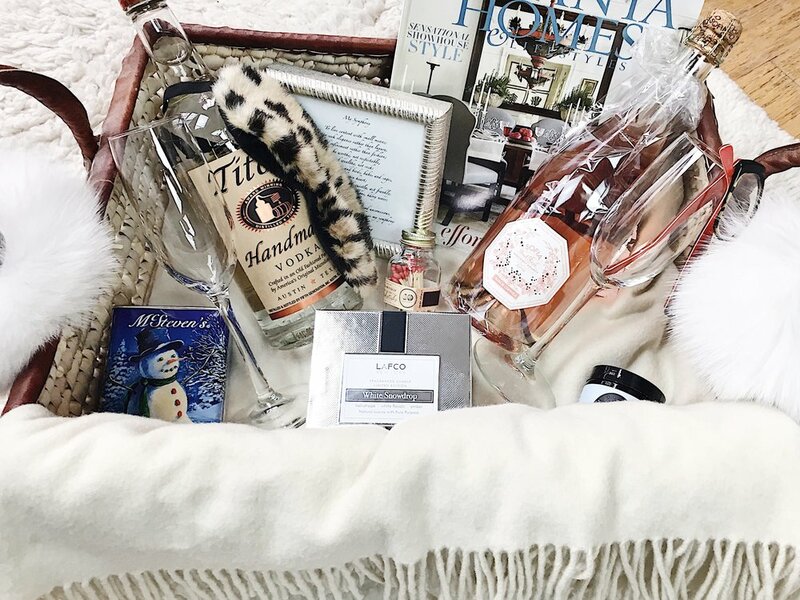 So below is the ultimate hostess gift, but can you imagine having a wintery night when you pour yourself this cocktail, snuggle under the throw, and simply have a luxurious evening to yourself? Do not miss checking out those cuffs on the handles! White fur cuffs - these actually can be worn with anything -see the Instagram photo here - so fun! Take just ONE of these items and thrown then with your bottle of Sofia and you are set. 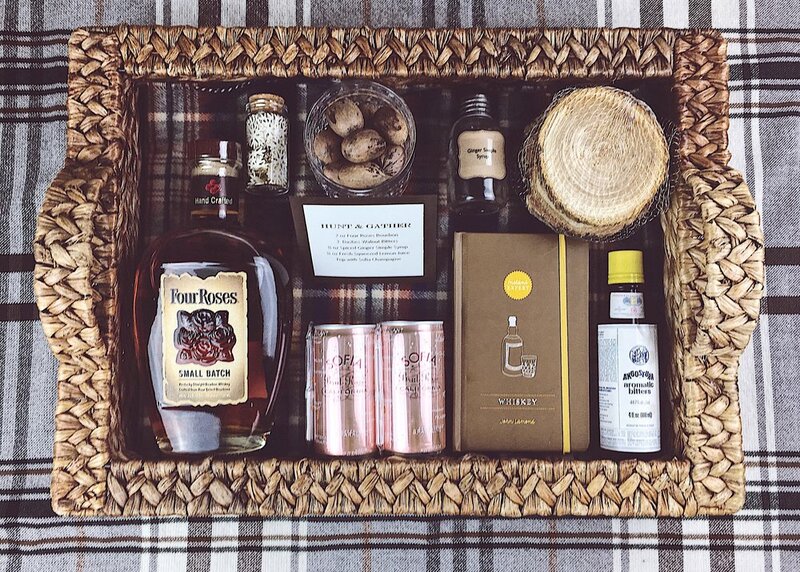 I want to create this basket just for me. I think you do this if you are a guest for a week - and you have your own guest house and butler. Happy Holidays and Happy Hostessing!